Maria Felice Radini Tedeschi, the Superior General who led the Institute for 29 years, from 1908 to 1937. She had imbibed the spirit and zeal of the Foundress and found ways and means of carrying the missionary flame to India, to kindle the fire of Divine Love in the hearts of the Indian people. To this end, she chose, prepared and sent a band of five brave and generous Pioneers, Maria Annunciata Rossetti, Maria Saveria Sabbadini, Maria Elena Valsecchi, Maria Margherita Benocci and Maria Assunta Lusardi. They landed in India on the shore of the Arabian sea, at Calicut, Kerala, on 12 Nov. 1934. The prophetic vision and mission of the Foundress was thus fulfilled. Maria Annunciata Rossetti Born at Fontevivo, Parma, on 22nd February 1879. Professed on 25th March 1897.Came to India on 12th November 1934, at 55 years of age. Had been a boarder at our Convent of Fidenza, a Novice under Mother Radini who formed her in the true spirit of the Institute: a spirit of prayer and of zeal for souls. She had served the Lord in all the offices among the youth and in the Community, in Italy till she was appointed Superior of the Pioneers Missionaries during their early days in India, at Calicut and Cannanore, up to the time of their internment at Payyanur during the Second World War, 1939 -1945, when Mother Margaret Benocci replaced her. She became blind due to a wrong treatment and was offered the choice of returning to Italy but she chose to remain in India, her land of adoption. For 30 long years she was totally blind, but considered her blindness a gift which had opened to her marvelous supernatural vistas! She could still teach the Novices how to recite the Psalms and other prayers which she new by heart. Mother Annunciata died at 94 years of age, at Cannanore, on 12th June 1973, and is buried in the cemetery of the Catholic Church, at Cannanore. Maria Saveria Sabbadini Born at Buenos Aires in Argentina on 18th September 1893. Her family had emigrated to South America, but returned to Busseto when she was a toddler and received Baptism then, on her returned to Italy with her family.. Our Institute opened a Convent at Busseto in 1920 and the young girl began to visit the Sisters. She soon asked to join them and, after her formation in the Novitiate, she made her first Profession on 21st October 1925. Mother Radini had been her Novice Directress and had formed her as a true Ursuline. Mother Xavier served in many offices, until she was chosen to be part of the five Pioneers who began and establish the Ursuline Mission in India. Mother Xavier collaborated with Fr. Caironi S,J. for the uplift of the Pulayas, a low caste of Malabar. She was the first Novice Mistress of the Indian Novices at Payyanur. She served in the mission of Mattul too, caring for orphans till her transfer to Cannnaore in 1961. Though she had lost one eye, she continued to work and to teach the young Sisters and the Novices to embroider, make laces and many other arts.She died at Nirmala Hospital, Marikunnu, on 20th October 1973 and is buried at Cannanore along with the other Pioneers. Maria Elena Valsecchi Born at Sala del Barro (Como) on 18th October 1891, she made her first Profession on 4th December 1932. She had joined at 40 years of age because she had to assist her mother. She had been involved in many apostolic activities of her parish, teaching Catechism and as a member of the Catholic Action Movement. She was a true missionary moved by the burning desire to save souls. When she left for the Indian Mission, she had said: “I offer myself as a victim for our Indian Mission. I wish to love the Lord with all possible love and give Him glory with my suffering, if not with my work”. And so it was: She was struck by sickness very early, so much so that, instead of going to Payyanur, during the war with the Ursuline Community, she had to stay with the Bridgidine Sisters at Marikunnu, Calicut. At Cannanore, after the war, Mother Elena was confined to her room. A short while before she died she wrote in a letter: “I believe the Lord has accepted my prayers and this thought makes me happy and fills my heart with trust in God’s goodness.” She was truly a victim of Love, of expiation: simple, coherent, patient, loving and grateful. She died in 1969, on 1st May and is buried at Cannanore. Maria Margherita Benocci Born at Radicofani (Siena), Tuscany, on 11th December 1903, she made her professionon 12th October 1929. She was the youngest of the Pioneers who landed in India in 1934. She was sent to Bangalore to train as a Nurse and to learn English, and returned full of zeal. She directed the Mission after Mother Annunciata, was Mistress of Novices and Superior in many Communities. During the Second World War, when the Sisters were interned at Payyanur and there was no communication with the Mother House in Italy, she strove to take care of the temporal needs of the Sisters and of the orphans by making and selling ‘Italian pasta’, and other items. Mother Margaret, as she was called in India, was very affectionate and compassionate towards all, especially towards the poor. A real mother to the Sisters and to the orphans, she cared for them in all possible ways to the point of personal sacrifice. Mother Margaret served the Lord in many Communities, in the South and in Nord India. Her last years were spent at Bangalore, where she died suddenly on 14th May 1987. Her mortal Remains were brought to Cannanore and buried along with the other Pioneers. Maria Assunta Lusardi Born at Mucinasso, Piacenza, on 15th August 1896, she made her first Profession on 4th November 1923. She served in the Indian Mission from its birth in 1934 to 1951, when she returned to Italy because of sickness. Back in Italy, she made herself useful as much as she could, but specially by praying much. She used to say: “Let us pray for the Institute, for the Mission and for the cause of our dear Foundress. And may the Lord send us good vocations according to the spirit of the Institute”. She died on 27th October 1969 and is buried at Piacenza in the tomb of the Ursuline. The Pioneers faced trials and difficulties of all sorts, in their early life in India, especially during the Second World War which had isolated them. 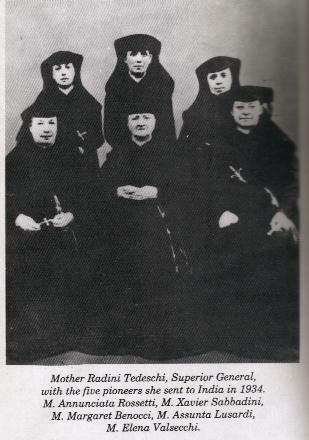 However, their courage and trust in God’s Providence, were the seeds that made the Institute grow steadily in various parts of India, through the leadership of Mother Margaret Benocci, Mother Stefania Murelli, Mother Aloysia Vaz and the other Superiors and Provincials who followed them Other Daring and courageous Italian Sisters who rendered their services in India. 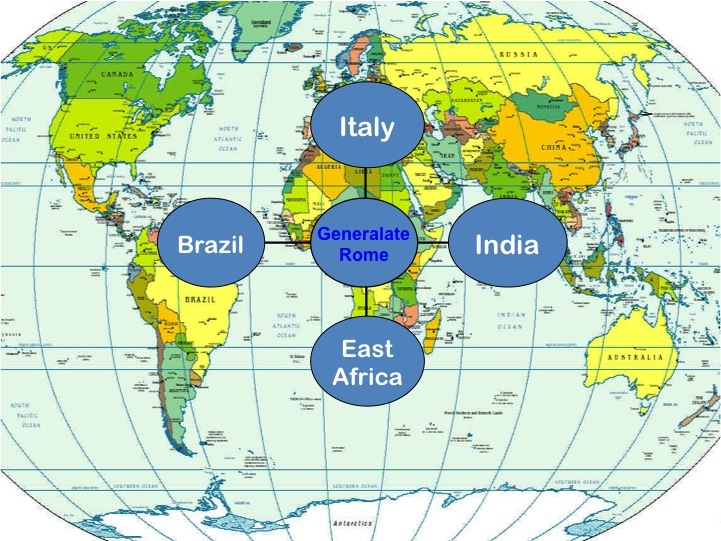 Today the Ursulines of Mary Immaculate of Piacenza - UMIs – are present in Italy, India, Brazil and Africa. They render their services in schools of all kinds, in medical centers (Hospitals and dispensaries), in welfare and pastoral activities. In numbers: they are about 770.